Don't throw a 1: Wigmore Warriors at Salute 2013 - The Battle of Flodden. Wigmore Warriors at Salute 2013 - The Battle of Flodden. Last year I was contacted by John from Wigmore Warriors, Wargaming Group. He sent me some photos of his growing collection of figures that he's painting up for the Battle of Flodden, he has used some of the Flodden flags that I previously posted, which I'm very pleased about! Its great to see someone else using them apart from me.
" The Wigmore Warriors will be staging the Battle of Flodden 1513, probably we wont be the only ones as its the 500th anniversary of the Battle this year. 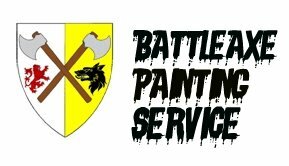 We are a small group of friends and like minded wargamers spread from Luton to Essex who have been putting on games at Salute for twelve years. Flodden is my baby, a guy from the battlefields trust planted the idea two years ago and your flags and a copy of Barrs book prompted me to get it going. All the units will be represented. The figures are a mix of old Glory, Dixon and Redoubt Enterprises. Figure scale is 1:100. As for rules, I am not sure what we will use yet. I have in mind Peter Pigs Bloody Barons or Lance and Longbows Polaxed." So if your at Salute on the 20th April this year, go check them out, by the look of the figures it should be a great game. I think your right, David's done a great job. Have said it once, will say it again, the most I see these models, the more I want to get into historical. But after 2 failed attempts in Turkey, means it will have to wait until I find a group that is more into it! But argh on the timing of Salute this year!!! Step into the light, move away from the dark side. Looking forward to them at salute, which reminds me I need to get on the ticket case. They do look marvellous, Wish I was going to see them in person. Shame you can't make Salute!! Shall need to look out for these amongst others at Salute this year. If I can get to Salute this year I shall look them out. Lovely work indeed Ray! Very impressive! lovely, indeed! - but the most I like the artillery piece. Really an impressing masterpiece! They look great and will look very spectacular en-masse. Very nice figures. Visited Flodden a few times, very evocative. Seriously tempted to go to Salute (for the first time) to have a look at those. Try and make it, its a great day out. Five hundred years? That needs a big celebration and battle. I'm battling myself to get my 15mm Flodden figures completed for the anniversary too. Great looking figures Ray. That dio with the cannon is especially nice and your flags look great. Glad to hear you'll be doing a game at Salute. What? I think you misread the post Anne!! Oooops I did. That's what no sleep gets you. It must give you a warm, fuzzy feeling knowing that your work has been used to such great effect by others - great job. You get better with age, Sir Raymond. Nice to see your flags getting out into other collections. Bravo!! I quite like how he's done his artillery - very tasty. Yep, it is rather nice and so are the artillery. That's a great looking force you have there Ray! Very nice, thanks for sharing the pics. Love the arty! Great looking figures there and a nice range of flags and clothing. Must not look....must avoid getting into yet another period...damn my eyes for looking.....argh! Excellent. That's what I call first class work. Figures and flags look good, will check them out at Salute. I admire how much time and work you guys put into this. What a great amount of nice painted figures! Thanks for sharing Ray!